The pro-big business President Barack Obama and his corporate allies are starting their campaign to manipulate and pressure Congress to ram through the “pull-down-on-America” Trans-Pacific Partnership (TPP), a trade and foreign investment treaty between twelve nations (Australia, Brunei, Canada, Chile, Japan, Malaysia, Mexico, New Zealand, Peru, Singapore, the United States and Vietnam). The first skirmish is a fast track bill to have Congress formally strip itself of its constitutional authority to regulate trade and surrender this historic responsibility to the White House and its corporate lobbies. Lest you think the TPP is too commercially complex to bother about, think again. This mega-treaty is the latest corporate coup-d’état that sacrifices the American consumer, labor and environmental standards – inventively called “non-tariff trade barriers” – and much U.S. sovereignty to the supremacy of corporate commercial trade. No single column can adequately describe this colossal betrayal – camouflaged by phrases like “free trade” and “win-win agreements.” For comprehensive analysis of the TPP you can go to Global Trade Watch (http://www.citizen.org/trade/). Trade treaties, like NAFTA and GATT, which created the World Trade Organization (WTO), already have proven records of harming our country through huge job-exporting trade deficits, unemployment, freezing or jeopardizing our consumer and environmental rules, holding down regulations on giant banks and weakening labor protections. How does the corporate state and its “free traitors” construct a transnational form of autocratic governance that bypasses the powers of our branches of government and accepts decisions that greatly affect American livelihoods issued by secret tribunals run by corporate lawyers-turned-judges? Well, first they establish autocratic procedures, such as fast track legislation that facilitate the creation of an absentee autocratic government, which betrays the American people by going far beyond reducing tariffs and quotas. Imagine, when the TPP treaty finally gets negotiated with other nations in secret, the White House cynically classifies it as an “agreement” requiring a simple majority vote, not a treaty requiring two-thirds of the Congress for passage. 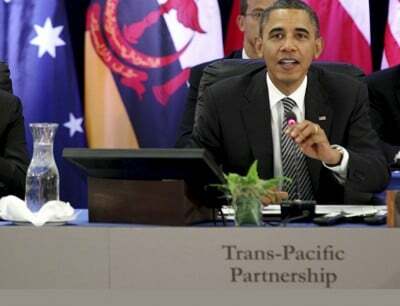 Fast track legislation then limits debate on the TPP to a total of 20 hours in each chamber. Then, Congress lets the White House tie Congress’ hands by prohibiting any amendments and requesting just an up or down vote. Meanwhile the campaign cash flows into the abdicating law-makers’ coffers from the likes of Boeing, General Electric, Pfizer, Citigroup, Exxon Mobil and other multinational corporations that show a lack loyalty to the United States (no corporate patriotism) due to their ties to communist and fascist regimes abroad who let them get away with horrible abuses and repression in the name of greater profits. Many of these Pacific Rim countries, for example, have bad labor laws and practices, few, if any, consumer or environmental protections that can be enforced in courts of law and precious little freedom of speech. A recent treaty with South Korea was pushed through Congress on false predictions of jobs and win-win solutions. In fact, the Korean agreement resulted in a ballooning of the trade deficit that the U.S. has with that country, costing an estimated nearly 60,000 American jobs. The majority of these corporate-managed trade agreements come from the demands of global corporations. They exploit developing countries that have cheap labor and lax laws, unlike more developed countries, such as the U.S., that have greater protections for consumers, workers and the environment. Under this trade agreement, countries that seek better protections for their workers and consumers can be sued by corporations and other nations. Remarkably, better treatment, such as safer motor vehicles, is seen as an obstructive trade barrier against inferior imports. For one example of many, under the WTO, the U.S. cannot keep out products made by brutal child labor abroad, even though U.S. law prohibits child labor in this country. This is how our sovereignty is shredded. Under the WTO, the U.S. has lost 100 percent of the cases brought before the secret tribunals in Geneva, Switzerland against our public interest laws –like consumer and environmental protections. The TPP will produce similar autocratic outcomes. Proponents of the TPP want to limit debate and prevent any amendments to this treaty that might deal with issues such as currency manipulation, child labor, bad workplace conditions, etc. by such countries as Mexico and Vietnam. What is enforceable, with penalties, are sanctions and lawsuits against our country (and others), which corporate power demands. U.S. taxpayers will ultimately pay that price. For example, if a company doesn’t like our controls over cancer-causing chemicals, it could skip the U.S. courts and sue the U.S. before a secret tribunal that can hand down decisions, which can’t be challenged in U.S. courts. If it won before this secret kangaroo court, it could be given millions or hundreds of millions of dollars in damages, charged to you, the taxpayer. Again, the big business “free traitors” are shredding our sovereignty under the Constitution. Senator Warren upset President Obama who, before a business audience (he wouldn’t talk TPP before a labor or consumer gathering), called Warren “wrong on the facts.” Really? Well why doesn’t he debate her, as Al Gore debated Ross Perot on NAFTA? She has read the fine print; I doubt whether he has read more than the corporate power tea leaves. He seems to have forgotten his severe criticism of NAFTA from when he ran for president in 2008. Right now, President Obama probably has the Republican votes in the Senate, but not yet a majority of votes in the House. The vast majority of the Democrats are opposed to the TPP. Tea Party Republicans are reducing Speaker Boehner’s vote count among Republicans. Using history as an example, President Bill Clinton easily peeled off votes during his push for NAFTA. What we need now are a couple of million voters around America to put serious heat on their faltering members of the House and Senate – not that arduous of an effort – over the next few months. That is fewer Americans than watch big league games on television. In addition, these civic-minded and active Americans would be backed by 75 percent of Americans who think that the TPP should be rejected or delayed, according to a bipartisan poll from the Wall Street Journal. People know what these “pull–down” trade agreements have done to them in their own communities.